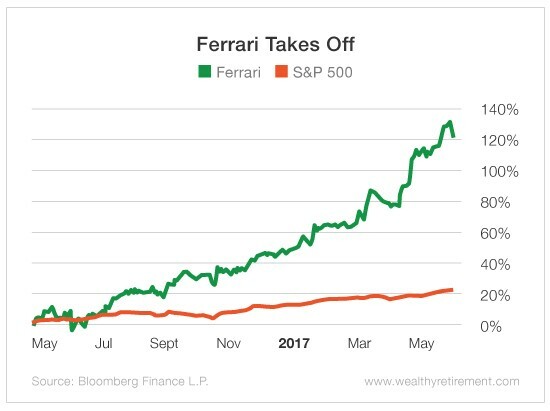 Ferrari (NYSE: RACE) went public in October 2015 to a whole lot of nay-saying analysts, and within a week, Ferrari shares traded below their IPO price. But 6 months later, the stock turned around. On May 19, 2016, the luxury car company declared its first dividend. That’s when Ferrari’s stock price really started to rev up. In just the last 13 months, Ferrari’s stock has returned 121%. That is about 6X the return of the S&P 500, impressive yes? Notably “dividend pioneers” like Ferrari outperform year after year. The Big A: It comes down to common sense. A dividend initiation sends investors a loud and clear signal. It tells stakeholders a lot about present and future cash flow, and it signals that a company is doing well. A dividend initiation usually means that the company is throwing off more cash than it needs to cover the dividend. And it expects to make enough money to pay it in the years to come. Dividends are more than just checks in the mail. They are public commitments to the company’s shareholders. If a company decides to pay a dividend today, investors will expect it to pay another one tomorrow. And most investors will expect the dividend to grow. Breaking that promise has disastrous implications for share prices. I expect Ferrari to grow and pay dividends in the years to come. I am a fan, and have been one for 50 yrs.